In a data-driven economy, industry leaders rely increasingly on skilled professionals who can see the significance in data and use it to solve business challenges, create new opportunities, and shape change. 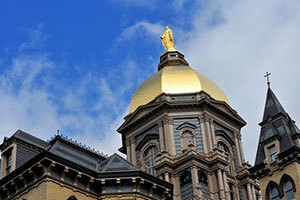 With a growing need for skilled data scientists, the University of Notre Dame, in collaboration with AT&T, has announced its new online master of science degree with a specialization in data science. Offered by the Department of Applied and Computational Mathematics and Statistics, with the collaboration of the Department of Psychology, the Department of Computer Science and Engineering, and the Mendoza College of Business, this degree program will prepare graduates for careers as data scientists in a wide range of industry fields fields including management, marketing, information technology, government policy, health care, finance, education, and scientific research. The 21-month degree program, offered at half-time pace to fit the schedule of working professionals, features the flexibility of online learning, small classes led by Notre Dame faculty, and exclusive in-person weekend immersions with faculty, industry experts, and thought leaders at Notre Dame and in Silicon Valley. AT&T and Notre Dame have agreed to an ongoing collaboration around this degree. AT&T’s insights will inform the curriculum, which is oriented toward real-world projects, cases, and emerging challenges. AT&T experts and thought leaders will provide exclusive insights to program students. Current AT&T employees will also be eligible for discounted tuition and other benefits. In addition to essential foundation courses in statistics, mathematics, and computer science, the multidisciplinary curriculum will also feature data science ethics, storytelling, and communications; data science as a business process; behavioral data science; case studies; and practical applications drawn from industry. The program is being designed by a number of Notre Dame’s leading professors.